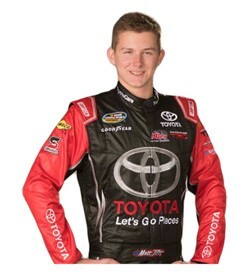 Concord, NC (May 5, 2015) – Kyle Busch Motorsports (KBM) driver Matt Tifft and Venturini Motorsports (VMS) will reunite for their third NASCAR Camping World Truck Series (NCWTS) effort this weekend in the Toyota Tundra 250 at Kansas Speedway. The early season NCWTS pairing between Tifft and VMS continues to build momentum. Tifft finished ninth at Martinsville Speedway in his VMS prepared Toyota Tundra and claimed a top-20 finish in the NASCAR Trucks’ season opener at Daytona International Speedway. “We’ve been competitive every time out. I have a great group behind me and I’m confident in the direction we’re going. Each time out the momentum builds. Coming off a solid top-10 at Martinsville adds to the positive momentum and will only make us stronger this weekend at Kansas,” said Tifft. Tifft, a University of North Carolina at Charlotte Freshman, has five NCWTS career starts with a pair of top-10 and top-20 finishes since making his series debut in 2014. Kansas Speedway will be his second truck start on a 1.5 mile track. “Kansas fits my driving style. Although I’ve never run here in the trucks I’ve had some success in the ARCA series. Last year in the ARCA finale we led a bunch of laps but cut a right front tire late in the race ending our day. I feel the experience will help me this weekend. No doubt the trucks will be more aero sensitive than the ARCA cars but having laps at Kansas under my belt gives me confidence going into Friday night’s race,” added Tifft. Tifft will pilot his unsponsored No.25 Toyota Tundra with crew chief Dave Leiner in command. Following Friday’s NCWTS Kansas Speedway Toyota Tundra 250 appearance, Tifft will join KBM at Charlotte Motor Speedway for his debut behind the wheel of the No.51 Toyota Care Tundra during the May 15th running of the NC Education Lottery 250. The NCWTS Toyota Tundra 250 from Kansas Speedway will air live Friday, May 8th at 8:30 PM EST on FOX SPORTS 1. Venturini Motorsports (VMS), fielding cars for over 30-years in the ARCA Racing Series presented by Menards, is one of the premier NASCAR driver development programs in the country. Multiple team championships and consistent on-track success, VMS has evolved into one of the most recognizable names in motorsports. Since 2007, VMS has assisted in the career development of notable NASCAR drivers such as Joey Logano, Justin Allgaier, Brian Scott, Alex Bowman, Ryan Blaney, Brennan Poole, John Wes Townley, Brandon Jones, and Justin Boston. Over the years the Venturini name has become synonymous with modern-day racing in America. In 2012, the Venturini family was inducted into the National Italian American Sports Hall of Fame (www.NIASHF.org) and now find themselves enshrined with such sports icons as Joe DiMaggio, Mario Andretti, Vince Lombardi, Tommy Lasorda and Rocky Marciano.